So, I have this big thing of fresh mozzarella and I really have to find ways to use it before it goes bad. I already did the Caprese salad the other night and it was great. Tonight, I thought I’d do something I hadn’t done in a long while. Usually, you just add shredded cheese to baked spaghetti, but it was such a big difference to use fresh mozzarella instead. It almost had a pizza character to it. Although, I didn’t use tomato sauce. Just EVOO and it was good to go. There’s so many different ways to approach this. I just happened to have some leftover ingredients and it worked out pretty good. No, actually it was heaven!!! Preheat oven to 500F. Cook spaghetti to al dente, drain and coat with EVOO. 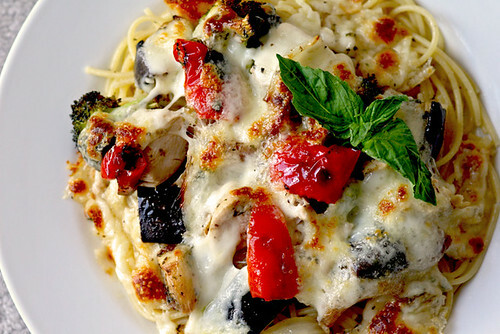 Transfer to an oven-safe platter and top with veggies, chicken and mozzarella pieces. Sprinkle with red pepper flakes and pop in the oven for about 6-8 minutes or until cheese is bubbly and a little brown on top. Be careful not to burn it, though. Top with fresh basil and parmesan cheese. Finish with a drizzle of EVOO. 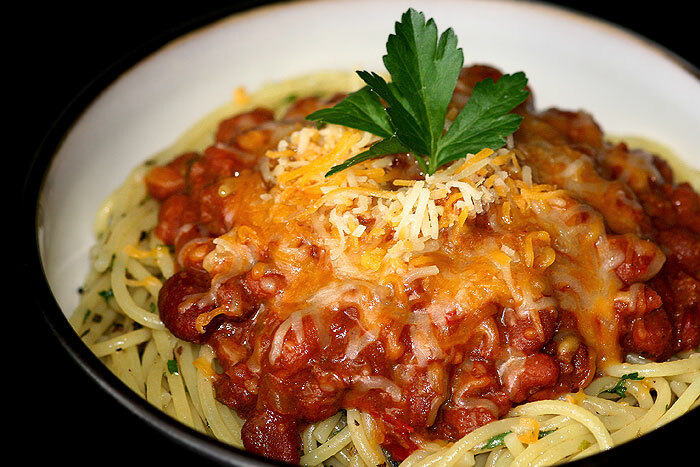 This is my own take on the classic Cincinnati Chili. Well yes, I’ve never been to Cincinnati but I know I’ve had chili spaghetti for as long as I can remember. And the truth is, just like BBQ, chili is a matter of personal (or regional) preference. I don’t know about you but I’m not that picky about it and I’ve so far enjoyed every version of chili I’ve ever had. Even some of the canned ones, in fact. Now, my take on this dish is in the pasta preparation. I dress my spaghetti so it’s not so bland and dry. Adding the raw olive oil and fresh herbs makes a big difference and it brings a more sophisticated flavor. Use good quality olive oil on this one. Cook spaghetti to al dente. Drain water and coat with olive oil. Mix in parsley (leave a little for garnish later) and salt & pepper to taste. Set aside. In a medium-heated skillet, saute onions with a little olive oil until translucent. Add in the chili with beans and mix until well incorporated and hot. If it’s too thick, add a little water or broth. You want the mixture to have a marinara sauce-like consistency. Transfer spaghetti to a bowl or plate and top with chili mixture. Sprinkle with shredded cheese and more parsley. 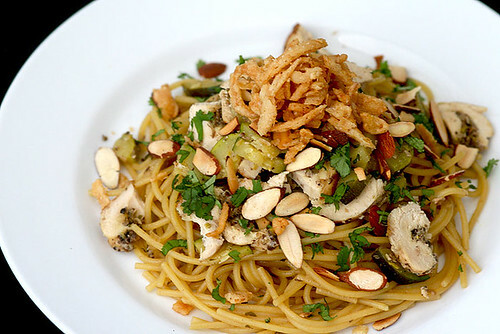 Drizzle with a little more olive oil. Serve with hot sauce, if you want. Okay, I have to admit that I got this idea from watching a segment of 30 Minute Meals. Is that a hair-raising proposition or what? But I like how it’s easy and fun at the same time. 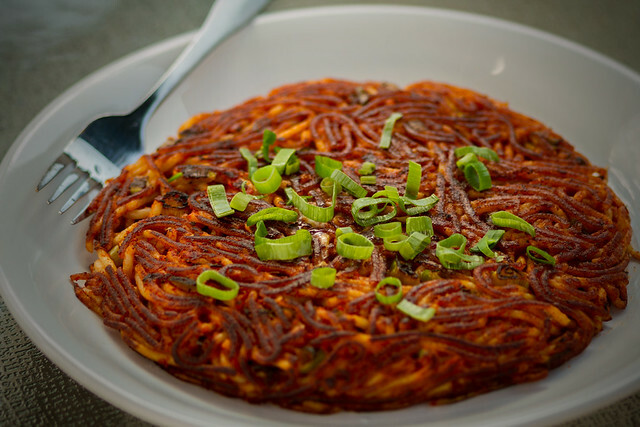 Think of it as an inverted version of spaghetti with meatballs. Umm, meatballs with spaghetti? Now, c’mon! Doesn’t that awaken the kid in you? I just couldn’t get the noodle strands to stand up but other than that, they are yummy for sure. And I also made it a little healthier than your regular meatballs by using extra lean ground turkey. By the way, I am planning on doing this again soon. But with an Asian twist, this time. Oooh… I can’t wait! Directions: Preheat oven to 400F. Break noodles into short pieces and cook to a minute short of al dente. In a mixing bowl, combine cooked pasta, ground meat, breadcrumbs, grated cheese, seasonings and about 4 Tbs of pesto. Don’t worry about salt as it is already present in a lot of ingredients here. Mix thoroughly. Roll into shape, sized no larger than a golf ball. Place on a baking pan lined with parchment paper (or use a non-stick pan). Stick in the oven for up to 20 minutes. Don’t overcook or it’ll get tough! Serve with remaining pesto (or marinara, if you wish) as dipping sauce.